The Sustainable Development Goals (SDGs) are a United Nations effort to create a common set of development goals in every country from 2015 to 2030. The countries adopted a set of goals to end poverty, protect the planet and ensure prosperity for all as part of a new sustainable development agenda. The success of SDGs involves engagement of different stakeholders. Financial institutions are one of the stakeholders that play an important role in contributing to the success of SDGs. The contribution of Islamic Finance institutions depends on both the economic returns on these projects and their orientation towards social and environmental issues. Currently, the role of Islamic Finance in achieving SDGs goals are still at early stage and need for further discussions. 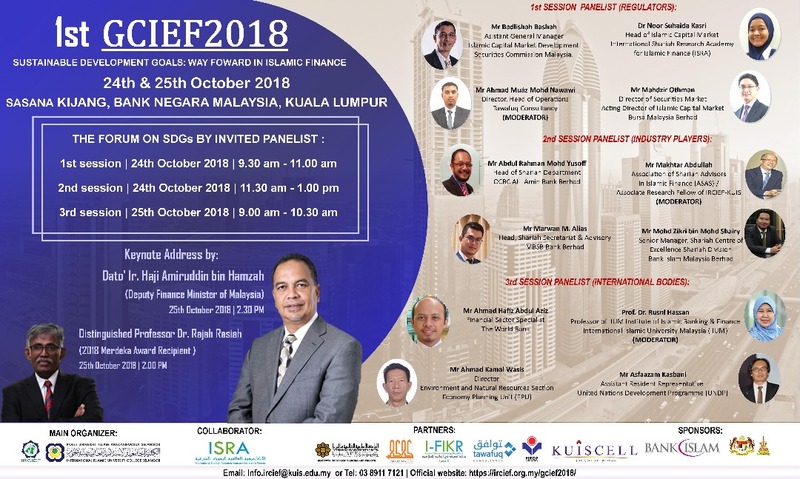 Thus, the Global Conference on Islamic Economics and Finance will be a platform for the intellectuals to discuss and to exchange ideas on the role of Islamic Finance in contributing towards the SDGs. To give exposure to intellectuals, students and industrialists relating to current issues in Islamic Finance. To give exposure in understanding the Sustainable Development Goals (SDGs) from the aspect of Islamic Finance. To establish concrete understanding and solutions for current issues in Islamic Finance. To encourage intellectual norms in society.